Is the Long-Dead “Obvious Adams” Behind This “Vodka-Flavored” Vodka Advertising Campaign? Vodka is pretty much…vodka. It’s unaged. Colorless. Like water. In fact, the word vodka comes from the Slavic word voda–which means little water. But anyone who’s tasted vodka knows that there is nothing little about it. Think burnt wine. Tasteless, clear burnt wine. And because of its supposed non-detecting character vodka makes for the perfect alcoholic beverage when keeping your drinking habits on the down low is of the utmost importance (office lunches, children’s birthday parties). Of its neutral flavor Smirnoff once said, “It will leave you breathless.” Have a drink and no smell of liquor remains detectable on the breath (just stay away from the ladies). Speaking of ladies, vodka marketers have noticed that a drink made out of grain or potatoes (it’s mostly ethanol and water) isn’t going to attract a female drinkership. So what do they do? Flavor the vodka. You know, raspberry, blueberry, green apple, mango, vanilla, coconut, birthday cake. In the meantime, even with the non-flavored variety vodka producers have managed to create very strong expectations of difference through massive brand-building campaigns so people expect the vodkas to differ from brand to brand. Let’s explore that a bit. These are all examples of perceptions setting expectations. They are hard to shake. You can see expectations work in the literary world, too. Stephen King can write a series of novels under the pseudonym Richard Bachman–and the sales indicate that Stephen King, without the name, is no Stephen King. So exploiting expectations is key to branding. Grey Goose. Ketel One. Three Olives. Absolut. These are all so-called premier brands. Each producer sinks millions into campaigns to create an image that they are clearly distinct from each other. Yet tasting vodka is a lot like tasting bottled water or snowflakes. But don’t tell that to a discriminating panel of vodka tasters. Long ago the New York Times lined up a series of twenty-one vodkas and invited some high-profile beverage tasters to a blind taste test. The panel focused on unflavored vodkas, and you would expect that the fancy labels like Ketel One and Grey Goose would win out. Not even close. For the most part the results appeared random–except the clear winner. That was the red-headed step-child of vodka: Smirnoff. The cheapest in the family. I’m not a vodka drinker so I don’t pay attention to vodka ads. However, there have been two in the past five years that have made an impact on me. One was a Thievery Corporation song sponsored by Skky (it made me cry–the song, not the vodka). The other has been the Maximus vodka-flavored vodka for men. Maximus is doing so many things right here: tapping into the reaction of men who feel like they are being stripped of their masculinity. Who thirst for adventure. Who think life has more to offer than changing diapers and riding Vespas. This is Dos Equis’ “Most Interesting Man in the World” meets Old Spice’s “The Man Your Man Could Smell Like.” This is for the man who longs to wrestle sharks, eat river rapids for breakfast and chase whales with his sweaty horde. W+K London is the agency behind the new campaign, pulling in Mort Künstler, iconic illustrator of American historical events and pulp fiction. One might think W+K London as geniuses. I’d rather credit them for seeing the obvious. Who in the World Is Obvious Adams? In the early 20th Century advertising man Robert Rawls Updegraff wrote a slim book called Obvious Adams: The Story of a Successful Businessman. It’s a tale about a copywriter who worked his way up the chain in an ad agency by spotting the obvious. He did this with a men’s hat store. A cake mix. And in what may be considered the climax of the book, he did it with bond paper. He found that this mill’s paper was made of selected white rags; that the purest filtered water was used in the making; that it was I dried in a clean loft; and, most surprising of all, it was gone over sheet by sheet and inspected by hand. Adams recognized the advertising possibilities because nobody knew this about bond paper. He spent the next day in his hotel room putting together a rough advertisement, and on the fourth day he walked into the president’s office and presented the layout. The president wasn’t happy. Didn’t Adams know that every good bond paper was made the same way? There was nothing original with his advertisement. Run this campaign and he’d become the laughing-stock of the bond paper business. I know there is nothing clever about these advertisements. They are just simple statements of fact. But I honestly believe that the telling them in a simple, straight-forward way as qualities of your paper, month after month, would in a comparatively short time make people begin to think of yours as something above the ordinary among papers. You would be two or three years at least ahead of your competitors, and by the time they got round to advertising, your paper would already be entrenched in the public mind. It would be almost a synonym for the best in bond paper. And that, my friends, is the curious secret to getting people to believer you. Adams got it right by stating the obvious. Maximus got it right by stating the obvious (vodka should taste like vodka). 1. Keep it simple – Your concept should have as few working parts as possible. The more working parts, the more dots, the more points of failure, the more a consumer has to connect, the more likely he’ll get confused. 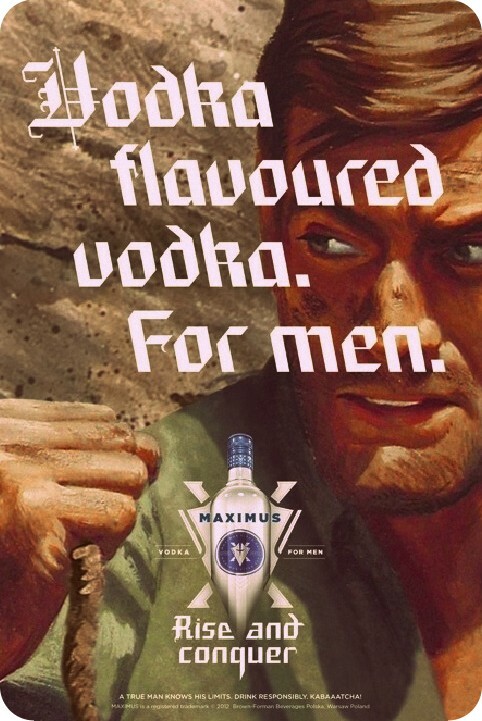 Maximus uses just two concepts to converge into one simple, penetrating idea: the flavor of vodka and men. Pass. 2. Pass the human nature test – Can you explain your concept to your mother and she gets it? What about your Romanian grandfather? Or the Philippine fellow who lives down the road? If your concept makes sense to most people, then you probably have an obvious solution. Any one of these people would feel that Maximus’ concept is a no brainer. Pass. 3. Summarize on paper – Can you explain your concept in one or two sentences? One or two paragraphs (at the most)? Can you use simple words? When your concept becomes long and convoluted on paper, you probably need to go back to the drawing board. “Vodka-flavored vodka. For men.” How much simpler could you get? Pass. 4. Blow people’s minds – A crystal clear signal that you have an obvious solution is when people slap their foreheads and say, “Now, why didn’t I think of that?” This was exactly my reaction to the Maximus ad. Pass. 5. Nail the timing – You may have to sit on some obvious ideas because their time is not right. Your idea may not be explosive in one year, but wait two and it could be a supernova. Maximus couldn’t have come at a better time, capitalizing on the backlash of men feeling emasculated. Pass. Those five principles–and the Maximus campaign–embody the high-pitch concept: spotting the obvious and then compressing that concept into a ridiculously tight, but compelling sentence. It’s an essential skill for competing in a hyper-competitive world. So, what are your thoughts on the campaign? On being obvious in advertising? Do you have any favorite examples of high-concept pitches? Do you think W+K London had Obvious Adams in mind when they developed the Maximus campaign? Share your thoughts in the comments below. Brutal and all. By the way, if you loved what you read, why not subscribe to CopyBot (but only if you loved it). Then follow me on Twitter or Google+. I want to drink this vodka. And I don’t even like vodka. Very effective campaign judging, if nothing else, by my own reaction to it. Hell, just by seeing this ad I feel like my fertility has increased. Curious what the sales numbers did after this campaign. As Ogilvy would say, that’s where we find the real success of advertising. The “waterfication” of vodka over the last 10 years or so, truly irritates me as a martini guy. Drinking a glass of what is basically straight booze should burn a bit, right? I mean, what do you think I am…NOT a masochist? I’m drinking a glass of paint thinner for crying out loud. Anyway, the concept speaks to an actual problem I have with vodka…that’s the point of good copy. Soothing is for women, right. 😀 I have the same problem with beer–all the flavors and waterfication (which is why I hate Bud products). Fills your man jaw with sugar raspberry and left, left, right jab of vanilla and chocolate. Booom! Emerging in to the bold and shining character of chipotle man peppers. Leaving you with a chop-chop kick of spicy heat. Kaabooya!